As many of you know who are tracking with this blog, I have just returned from a ministry trip with Judy to Paris. There is no way I could ever begin to give a report on all the conversations we had with various people in the larger Body of Christ there. The interaction we had with especially younger workers (or potential workers who obviously have a call on their life) has reinforced in me, more strongly than ever, the need to pray for the Church in Paris. While much of what I am talking about applies to all of France, I especially see the need to pray for Paris. First, let me give a bit of background. Among the younger generation in Paris (and probably all over France), there seems to be a new openness to Biblical Christianity. Ten years ago, or even five years ago, there seemed to be a resistance to the Gospel. And even among Christians, there seemed to be a resistance toward change from the status quo. That is changing rapidly. And I believe that this new openness is spreading to older generations too. By the way, there are others making similar observations (see link below). I think it is also important to note that confidence in the current institutions (political and government, economic, social) is fast eroding, or perhaps even gone completely! This current presidential election is one example. Almost everyone with whom I spoke said that none of the candidates were good, and that people voted more out of protest and anger than conviction. The current economic crisis in Europe is another example. Few have confidence in any solutions being put forth by economists and politicians. All these things just reinforce the Biblical truth that this world is corrupted by sin, and that the real need in this world is spiritual, and that need can only be filled in Jesus Christ and a commitment to authentic discipleship. On the one hand, I am seeing so much potential for the Church in Paris. There is a growing number of younger workers who are ready to stand and live on Biblical principles. There is a growing dissatisfaction with the current church situation and a desire for the Church to be as described in the New Testament. There is a deeper burden for those who are spiritually lost. I also am seeing an emerging vision to take the Kingdom to other places, especially among the North African populations in France, and to North Africa. Perhaps most important, though, is a hunger for the Word of God and for the Lord Himself. Though there is still plenty of room for growth in all these areas, I personally am very encouraged by what I am seeing and hearing. On the other hand, I also see that the kingdom of darkness is actively engaging in a plan to tear down and tear apart the Church in Paris. There is so much disillusionment among Christians due to conflicts and division that have taken place in the past five to ten years. Many church leaders are responding to the current spiritual transitions taking place in France with insecurity and a desire to protect their own interests. There seems to be few examples of godly leaders that are ministering from a position of servanthood and humility and other Biblical principles. By the way, teaching about godly leadership and encouraging younger workers to pursue a ministry of selflessness are major themes of the workshops we are doing in Paris. See article in Religion Today: What Nobody is Saying About France. Note: I actually wrote this earlier in the week when we were still in Paris. However, I had a difficult time uploading this on the blog site. So here it is. I plan to write a fuller entry within the next several days. Judy and I have been here in Paris for about five days now. We have met with a number of people, and on Saturday, we did a workshop for a group of Christian workers on Building Biblical Discipleship into our church communities. On Sunday, we attended a monthly gathering of Christians that worship and pray for the city of Paris. That was very encouraging, and the worship, led by Pierre Nicolas, was excellent. I Kings 18 describes a time in Israel’s history when there was a severe drought…….much like the spiritual drought that has been in Paris. But Elijah the prophet heard the sound of a roaring rain that would put an end to this drought. He did not literally hear this, but he heard it in the Spirit. He went to the top of a mountain and began to pray. He sent his servant to go look out toward the sea and tell him what he saw. Nothing! So he continued to pray and sent him out to check again. And nothing! This happened six times and there was nothing. But Elijah kept praying. Why? Because he had heard the sound of a roaring rain! There are many of us who hear the sound of a roaring rain coming to Paris that will put an end to the spiritual drought. But we keep praying. Yesterday, we met with some of those prayer warriors. Well, most of you know the rest of the story. The seventh time the servant checked, he saw a small cloud. Elijah then declared that the downpour was now coming. And that is what happened! May the Lord raise up many across this earth who won’t listen to those who see nothing, but will keep praying because they have heard the sound of a roaring rain! Actually, there are some of us who are seeing a small cloud coming up on the horizon. As some of you are aware, I have been going to Paris rather frequently. This week I will be making the fourth trip in 13 months. Some have asked, “Why Paris?” I would like to share a little today about why we are going there. A little over 10 years ago, while on a personal retreat, I felt the Lord speak to me saying that just as He has poured out His Spirit upon the Spanish-speaking world, He was going to do the same in the French-speaking world. I sensed this so strongly, I immediately began taking French classes at our local community college. (I should mention that though I can understand spoken and written French fairly well, I am very far away from being fluent). 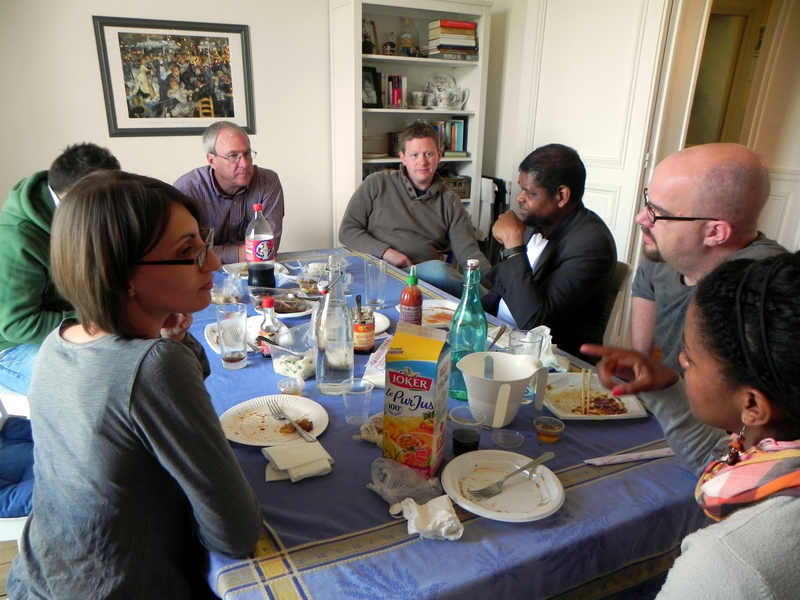 As a church we began visiting France and meeting people. We began praying. Over these years, the Lord has given us some precious relationships there, especially with some Christian workers. However, it is beyond the scope of this blog entry to tell of some of the amazing ways we have seen God working. There is another reason for focusing on Paris. We have discovered that France is a very influential country. The French-speaking world spreads around the globe (Europe, North Africa, West Africa, Southeast Asia, Pacific islands, etc). And much of these areas lie in some of the most spiritually unreached and dark places of the world. France, and in particular Paris, leads the French-speaking world. In the English-speaking world or Spanish-speaking world, there is no one city that dominates the culture like Paris does the French-speaking world. We believe Paris is a very strategic city in the purposes of God today. There are some wonderful people and wonderful Christian workers in Paris. But it has been a very difficult road to travel. There is much spiritual resistance in Paris. There has been a large Islamic influx into France in the past 20 years or so. In fact, there are more Moslems in Paris than there are Christians in all of France! There have also been many disappointments and setbacks for the Church there which I do not have the time to explain. I believe, however, that God is using all this resistance and all these trials to strengthen spiritual leaders and workers that can lead the Church in Paris into all that He has called her to be. Tribulation and trials have a way of purifying God’s people. That is what is happening today in Paris. God is preparing a people that are going to be mighty for His Kingdom. Judy will be traveling with me to Paris this week. In addition to visiting with many people, I will be doing a workshop on Saturday, May 12, for a group of Christian leaders. The topic will be on building Biblical discipleship into our churches. Please pray for us while we are there. There are many we need to see, but so little time. My goal (no promises, though) is to write one or two times while we are there. I will share some pictures as well as some personal observations. For 25 years now, I have used this illustration that, for me, has been helpful in describing what is God’s intention for the Church. Of course, no illustration is perfect; all still have limitations, and even flaws. Still, a visual picture can sometimes portray a thought or idea that words cannot. In this illustration, posted above, we see three areas that a local church needs to be growing in, if it is going to be healthy. You might call these essential building blocks for a healthy church. First, there is what I am calling Biblical Discipleship. This serves as a foundation to whatever else the church might do. Discipleship is an individual pursuit for the most part, yet it is the church’s responsibility to build this foundation of discipleship into the individual lives of the congregation. Discipleship is much more than just some program we expect people to go through. More than anything else, it is an ever-deepening relationship with Jesus. It includes learning and studying the core teachings of Jesus. It is then pursuing a life devoted to living like Jesus, or living by these teachings in a practical way. Jesus told His disciples that the way to build on solid ground was to not merely hear His words, but to act upon them. However, we quickly learn that trying to walk out these radical teachings of Jesus is impossible in our own strength. That is why Biblical Discipleship also must include an understanding of how we have been empowered with the resurrected life of Christ. We must know and walk by faith in who we are in Christ. These are just a few of the things that must be built into the lives of those desiring to truly be disciples. Biblical Church Life (or community) is the next building block. Note that this is built upon a foundation of discipleship. This is very important. The “church life” we see described in so much of the New Testament is only possible when practiced by those embracing discipleship. That is because Biblical church life is radical. We are told repeatedly to love (agape love, that is) one another. We are exhorted to be of the same mind and heart with one another. How can carnal Christians, or anything other than devoted disciples, do these things? We are reminded to serve one another, to encourage one another, to admonish one another, bear with one another, and forgive one another. Actually, depending on the translation you are using, there are about 31 different “one anothers.” Most of these cannot be done in the typical meeting environment. Church life is therefore something that is much more than a Sunday morning service. It is a family, it is caring relationships, it is working together and serving together throughout the week. Church no longer is defined as a organization, a building, or an activity on Sunday morning. There have been many in recent years who have stated the Church has lost her sense of community, and that it has become program-based rather than relationship-based. Yet many who have “tried community,” have abandoned these ideals. Why? Often it is because of the lack of true disciples. It is frustrating and discouraging to try to build community (koinonia) with “carnal Christians” who often fall into contentions and are motivated by selfish ambitions. The type of Biblical church life called for in the Scriptures is not possible…..unless it is built upon the foundation of Biblical Discipleship. Spiritual Multiplication (fruit bearing) is the third building block. The multiplication of disciples, various ministries, and even churches is something that many churches dream of. However, sustained evangelism and spiritual reproduction spring out of the foundations of Biblical discipleship and Biblical church life. The book of Acts is a perfect example of this, along with countless accounts throughout Church History. It is popular to have programs designed to increase evangelism and to sponsor evangelism crusades. And while these are often very useful, these things cannot be a substitute for building discipleship and community into our churches. 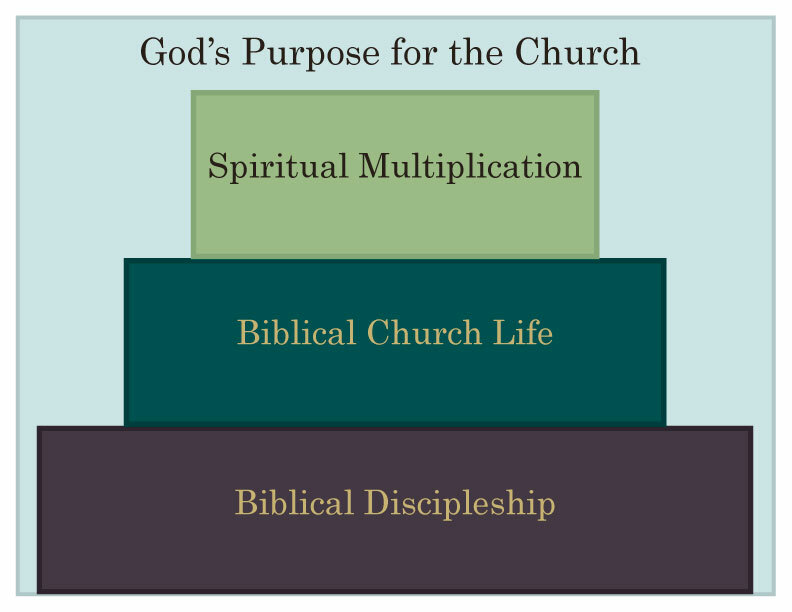 When a church is healthy and growing in these aspects, then multiplication will naturally flow. That’s because God’s power and anointing are reserved for those walking in the unity of the Spirit (walking in Biblical church life). So often, we try to circumvent God’s way of bearing much fruit, in a human attempt to get quick results. This is the fruit that fades away and is temporal…….but God is calling the Church for much more than this. It should be noted that we should not neglect building church life and spiritual multiplication just because we have more work to do in building Biblical discipleship. Let’s be building all three, but realize that as our foundation of Biblical Discipleship gets stronger and deeper, then so will our church life. And as that grows and deepens, fruit will begin to overflow. Let’s note, too, that in a typical church congregation, there will always be people hanging out on the sidelines. (Jesus said there would even be tares among the wheat). But it is important that there be a strong and growing core of disciples who are embracing Biblical discipleship and church life, and who are desiring spiritual multiplication. I have actually put together several one or two day workshops that explain these things more thoroughly. 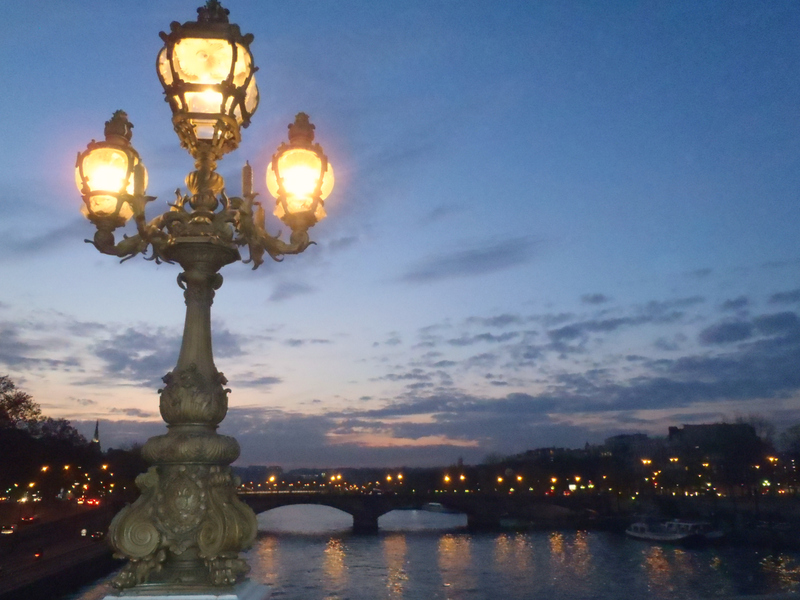 In fact, I will be in Paris next week doing a workshop on “Building Biblical Discipleship in our Churches.” My goal over the next several months is to share here in this blog more on each of these building blocks. I pray that these short exhortations will encourage more discipleship and deeper church life among all of us.